Evolution Fitness Professionals | Posture: Are you getting it Right or Wrong? 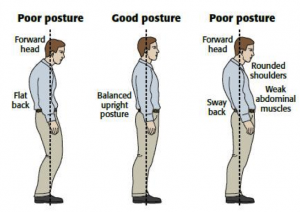 Posture: Are you getting it Right or Wrong? 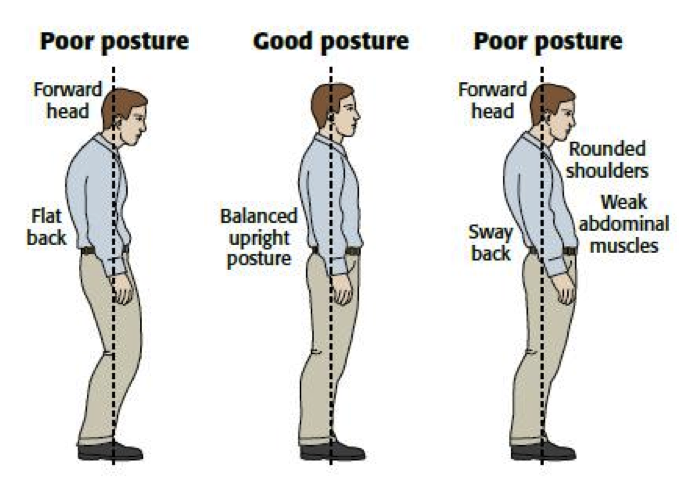 The term posture is associated to the way we sit, stand and walk, for example if we were to ask anyone to demonstrate a poor posture pose, this would be demonstrated by a slouched or a hunched position, either protracting their shoulders and rounding their backs to exaggerate a curve in the thoracic spine. When asked for a demonstration of a good posture, most people would automatically straighten up, raise their chins, and retract their shoulders into a military-type stand to attention. Evidently, for most people the term posture describes an overall body position, the way we hold or position our bodies. It is said around 40% of people who complain of back problems, have said it can be related to how they hold their posture, if we don’t know how to hold ourselves properly, our muscles, bones and spine become strained and fatigued. Our organs can become damaged, such as our heart and pancreas. As when we sit or are inactive for a long time our heart has to work extra hard, as our muscles are not burning of our fat. Therefore fatty acids are storing and clogging up around the heart. As fatty deposits store, it can cause high blood pressure, increased cholesterol causing the heart to work harder and faster, which could eventually cause a heart attack. As for our pancreas, this produces insulin, a hormone that carries glucose to cells for energy but if we are not active, the production of insulin is still being produced but not absorbed therefore can lead to a possibility of diabetes. Colon, breast and various cancers have been linked to prolonged sitting due to the insulin being produced, and encouraging cell growth within the organs. A foggy brain follows when there is lack of fresh blood and oxygen to the brain, therefore affecting our mood and slowing our body down. A strained neck, can occur for example when sitting at a desk for too long, the neck is being protracted forward and the neck becomes misaligned therefore straining the cervical vertebrae and causing permanent imbalance in the neck muscles. A bad back can be caused by an inflexible spine or disc damage, as when we move or exercise the vertebral discs in our back stay soft and flexible and expand and contracts like a sponge as the discs soak up fresh blood and nutrients, therefore if we don’t exercise, the discs become squashed and the tendons and ligaments become stiff and tight. As the discs become damaged the discs are more prone to herniation. Muscle degeneration will occur in all muscles involved, for example the abdominals play a major role in all movements, such as standing, walking and sitting up straight. Therefore if we slouch or slump in a chair the muscles become unused and the muscles in the back have an increased pressure and the spine become misaligned. Hip alignment is affected, as flexibility is needed to keep the hips balanced and due to chronic sitting, the hip flexors become shortened, stiff and tight, therefore limiting the range of movement, and the mobility of a person is reduced, and this is a major reason to why the elderly fall, or take a tumble, as they are not moving enough and the hips become tightened. Lastly, weak gluteal muscles (bum muscles) are affected by sitting on the muscles so they become limp (atrophy) as they are not doing anything, therefore soft gluts affect the stability and ability to maintain a powerful stride, when walking, exercising or standing. Overall, by sitting and not exercising or moving, the sitting posture of a person is affected, therefore affecting the way in which a person moves resulting in back problems, consequently to achieve a normal posture, regular exercise is needed and by minimising stress on muscles, bones, and joints.